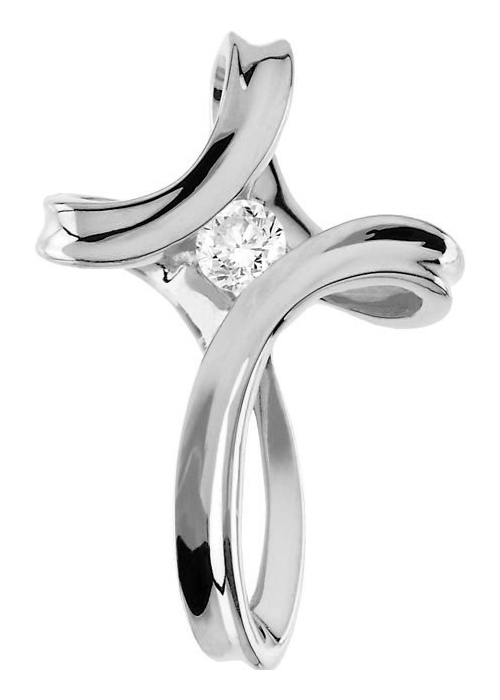 Apples of Gold Jewelry's 1/5 carat diamond twist cross slide necklace in 14K white gold is a stunning and polished white gold pendant that adds a twist! The four arms of the cross are formed using a twisting and looping design, and on this pendant, the chain fits through cross at top like a slide. In the center of the cross is a single diamond that is 0.20 carats, and is rated G-H for color and I1 for clarity. The pendant measures 1 inch tall and 0.67 inches wide. The highly polished design and the diamond make it a perfect design for those special nights out! "Delight thyself also in the LORD; and he shall give thee the desires of thine heart. "(Psalms 37:4). We guarantee our 1/5 Carat Diamond Twist Cross Necklace to be high quality, authentic jewelry, as described above.